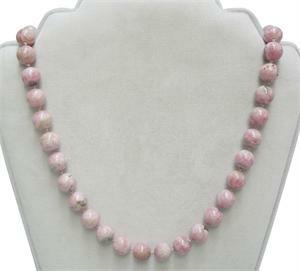 Item #IGM-RH-10-18-75: 18" necklace of 10mm round Rhodochrosite beads with gold-filled spring ring clasp. Item #BK-ER-0838: 14Kt. Yellow Gold earrings with 4.5mm round Colorado Rhodochrosites of 1.02 Cts. TW and post backs. Item #DR-LR-10604: 14Kt. Yellow Gold dangle earrings with 11.5mm and 16.5mm donut shape Crystalline Rhodochrosites, eight round Diamonds of .10 Cts. TW and post backs. Item #DR-LR-10603: 14Kt. 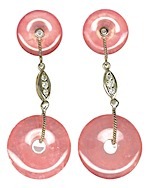 Yellow Gold dangle earrings with 12mm and 16mm donut shape Crystalline Rhodochrosites, two round Diamonds of .02 Cts. TW and post backs. Item #GSJ-2280: 18Kt. 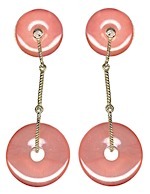 Yellow Gold earrings with 7.5x9mm kite shape African Rhodochrosite of 5.20 Cts. TW, eight round Diamonds of .32 Cts. TW and post & clip backs. Item #GSJ-2626: 18Kt. 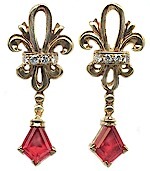 Yellow & White Gold earrings with 7.7x7.8mm square Colorado Rhodochrosites of 5.76 cts. TW and post backs.